The Natchez Trace is a 440-mile-long path extending from Nashville, Tennessee to Natchez, Mississippi, linking the Cumberland, the Tennessee and Mississippi rivers. It was used extensively by Native Americans and early Caucasian explorers as both a trade and transit route in the late 1700s and early 1800s. Today, the trail has been commemorated with the 445-mile-long Natchez Trace Parkway which follows the trail's approximate path. (See TNGenWeb's picture .) The trail itself has a long and rich history, filled with brave explorers, dastardly outlaws and daring settlers. The Trace, like many early footpaths, traces its beginnings to the natural wanderings of bison, deer and other game. After Native Americans first began to settle the land, they began to blaze the trail further, until it became a relatively (for the time) well-worn path traversable by horse in single-file, though it may have been traveled in part before, particularly by famed Spanish explorer Hernando de Soto. The first recorded Caucasian to travel the Trace in its entirety was an unnamed Frenchman in 1742, who wrote of the trail and its "miserable conditions." To Caucasians unused to the rigors of the journey, the assistance of Native Americans—specifically, the Cherokee, Choctaw and Chickasaw—was vital. The earliest formal usage of the trail, in fact, was for trade between those three Native American nations through which the trail passed. It was not until 1801, when the United States Armed Forces began blazing the trail for use as a postal route, that major work was performed on the Trace to prepare it as a thoroughfare for travelers. Treaties were signed with the Chickasaw and Choctaw nations, and work began, first solely by soldiers reassigned from West Tennessee, and then later by civilian contract. By 1809, the trail was fully navigable by wagon. Critical to the success of the Trace as a trade route were inns and trading posts, referred to at the time as "stands." For the most part, the stands developed southbound from the head of the trail in Nashville. By 1816, the stands along the Trace had almost reached a critical mass, but the continued development of Memphis, Tennessee and Andrew Jackson's military road, a direct line to New Orleans, Louisiana from Nashville, began shifting trade both east and west. The Trace entered a steady decline, and as author William C. Davis writes in his book A Way Through the Wilderness, it was "a victim of its own success." It had highlighted the benefits of trade with the mouth of the Mississippi, and because of the improved ease of water-bound trade, particularly the dawn of steamboat culture, it became obsolete. In 1830, the Trace was officially abandoned as an official road, and began to disappear back into the wilderness from whence it came. Despite its brief lifespan, the Trace served an essential function in the years it was in existence. It was the only reliable and most expedient link between the goods of the North and the trading ports of Louisiana. This brought all sorts of people down the Trace: itinerant preachers, highwaymen and traders were just a few. The circuit preachers were some of the most notable of the lot. Unlike its physical development, the "spiritual development" of the Trace started from the Natchez end up: several Methodist preachers began working a circuit along the Trace as early as 1800, and claimed a membership of 1,067 Caucasians and 267 African-Americans in 1812. The Methodists were soon joined in Natchez by other Protestant religions, including the Baptists and Presbyterians. The Presbyterians and their offshoot, the Cumberland Presbyterians, were more active than the Methodists or Baptists in procuring converts along the Trace itself, including the Native American population—the Presbyterians starting from the south, the Cumberland Presbyterians from the north. As with much of the unsettled West, the Trace was also a hotbed for banditry. Much of it centered around Natchez Under-The-Hill, as compared with its more tame sister city at Natchez On-The-Hill. Under-the-Hill, where the port to the Mississippi was located, was a hotbed for gamblers, prostitutes and drunkenness. The rowdiest of them all were the Kaintucks, the wild frontiersmen from upriver who came in on the steamboats and flatboats loaded with goods, left them in Natchez in exchange for pockets full of cash, and summarily treated Natchez Under-the-Hill as what could be generously called an early 1800s Las Vegas, Nevada or Amsterdam. Still worse dangers lurked in the wilderness outside the city boundaries on the Trace itself. Highwaymen such as John Murrell and Samuel Mason terrorized travelers along the road, and operated large gangs of organized brigands in one of the first examples of land-based American organized crime. Meriwether Lewis, of the Lewis and Clark Expedition fame, met his mysterious end while traveling on the Trace. Lewis had stopped at Grinder's Stand near current-day Hohenwald, Tennessee for rest. Extremely depressed by the state of his financial affairs (he was deeply in debt), he became drunk as he had many times during the trip. He asked the owner of the stand for gunpowder, which she gave him, intimidated by his behavior. A few hours later, two shots rang out in the night—Lewis had apparently shot himself twice, once in the head and once in the chest. He lived until the next morning. His death went unquestioned as a suicide for many years. However, as time passed, more details emerged—had he also been stabbed? Had one of his rivals, particularly Robert Grinder, owner of the stand, killed and robbed him? Or was it a more politically motivated killing, an assassination against the governor of the Louisiana Territory? In 1996 James E. Starr, a professor at George Washington University, attempted to procure permission, supported by several researchers and 160 descendants of Lewis, to exhume Lewis' remains to put the mystery to rest. The National Park Service, which oversees the grave sit in Hohenwald, denied permission. Though a court later ruled that the exhumation was justified, the NPS has so far successfully resisted the pressure to exhume Lewis. One of the many projects of the Civilian Conservation Corps in the 1930s was the Natchez Trace Parkway. The history of the Trace was brought to light by Mississippi Congressman Thomas Jefferson Busby, who proposed it as a way to give tribute to the Trace. Inspired, the Daughters of the American Revolution began planting markers and monuments along the Trace; in 1934, Franklin Delano Roosevelt's government ordered a survey. Construction on the Parkway began in 1939, to be overseen by the National Park Service. 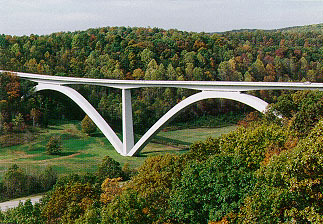 Its length includes more than 45,000 acres and the towering Natchez Trace Parkway Bridge in Williamson County, Tennessee, completed in 1996 and one of only two post-tensioned, segmental concrete arch bridges in the world. (See the Federal Highway Administration's photo .) There are numerous historical sites on the Parkway, including the Meriwether Lewis Museum, the refurbished Mount Locust stand, and the Ridgeland Crafts Center in Ridgeland, Mississippi, which focuses on promoting Mississippi's native art. Finally, the history of the Parkway and that of the entire Trace is nicely summed up at the Natchez Trace Visitor Center in Tupelo, Mississippi. James A. Crutchfield, The Natchez Trace: A Pictorial History. Rutledge Hill Press, Nashville, Tennessee. 1985. William C. Davis, A Way Through the Wilderness. HarperCollins Publishers, New York, New York. 1995.